A Transportation Worker Identification Credential (TWIC) is now required for individuals requiring unescorted access to the state-owned marine terminals. This site is for registering TWIC ID Cards with the VPA to gain access to one of the terminals we operate. The VPA does not issue the Transportation Worker Identification Credential. 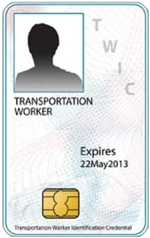 For more information on how to obtain a TWIC card, visit the TWIC Website. If this is the first time on this site, and your company is not registered, you must register to become an Account Representative (AR) for your company. Please add No-Reply@portofvirginia.com to your address book to ensure our emails reach your inbox. If you are not receiving emails, please ask your system administrator to verify that emails from No-Reply@portofvirginia.com are not being filtered. If your company already has an account and you are the AR for the company, login to manage your company, including filing Employee Separation Forms, Changing your company's information, etc.